October 1, 2013 By This post may contain affiliate links. Magic Bars are the perfect last minute treat to make, so try these Orange and Black Cookies and Cream Halloween Magic Bars! 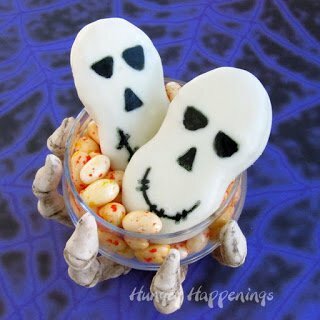 They are fun, festive, and full of spooky flavors! It’s crazy to think that at my age, I had never baked a pan of magic bars (a.k.a. 7 layer bars.) I don’t even think I’d ever tried them before. If I had, I certainly would have asked for the recipe. 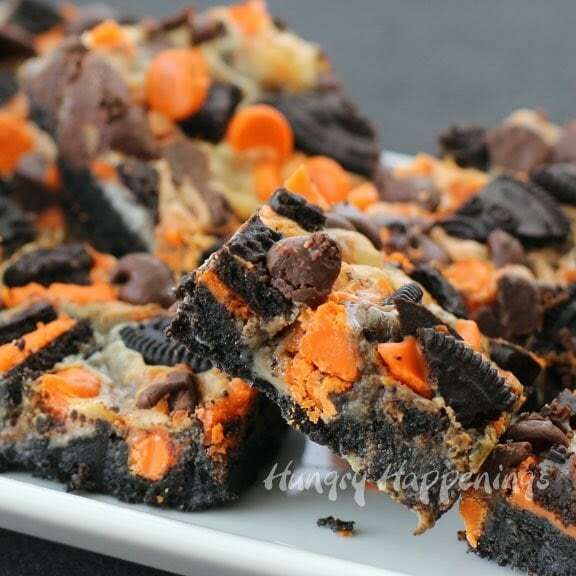 For months I’ve been drooling over pictures of magic bars seen on blogs and pinterest. I decided I needed to give them a try. 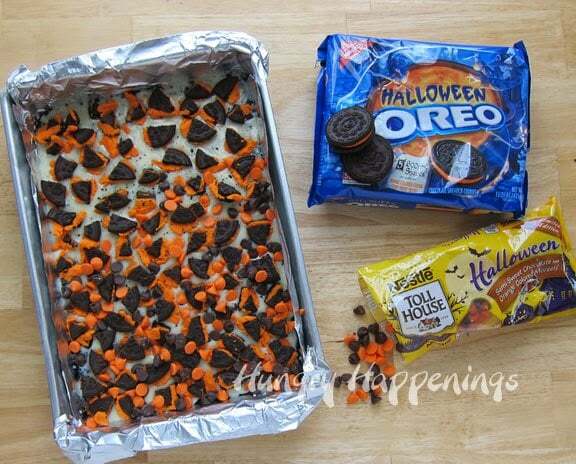 It took me less than ten minutes to make an Oreo crust, pour on a can of sweetened condensed milk and sprinkle on Halloween Oreo’s and Halloween Orange and Black Chips. The magic, I found, happens when the heat from the oven caramelizes the creamy milk. 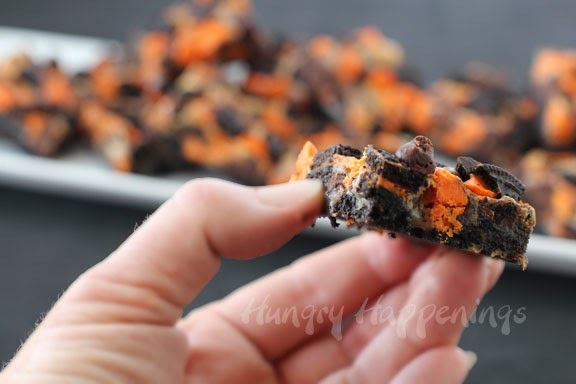 It glues everything together in one crunchy, chewy, chocolaty bar. Why had I never known about these before? I must have been living under a rock. You can go crazy thinking up combinations for these bars. The possibilities are unlimited. As usual, though, I wanted my magic bars to be a festive treat for the upcoming holiday, thus the orange and black motif for Halloween. 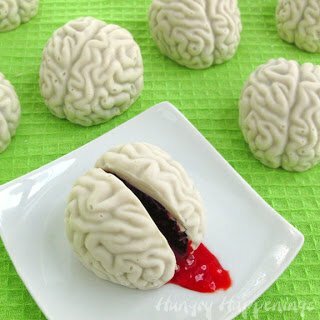 It isn’t quite as crafty as many of my projects, but I will definitely be serving these at many parties to come. 1 (11 ounce) bag of Nestle Halloween Semi-Sweet Chocolate and Orange Colored Morsels**Note: After a reader wrote to say her bars weren’t very orange, I thought it would be a good idea to reserve half of the Halloween Chips, bake the bars, then sprinkle on the reserved chips and melt them just slightly. That way your bars are sure to look nicely black and orange. The recipe has be adjusted. Preheat oven to 350 degrees Fahrenheit. Line a 9 inch by 13 inch baking pan with non-stick aluminum foil. 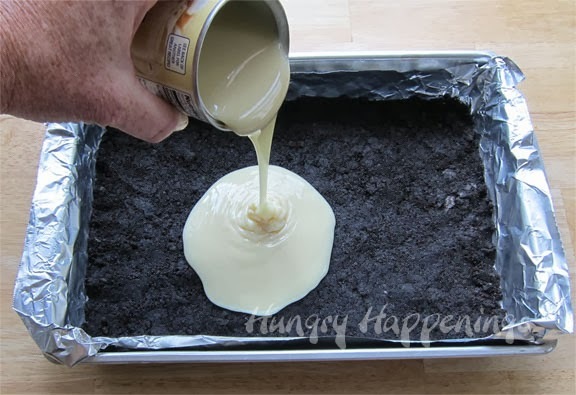 Mix the Oreo crumbs with melted butter and press it into the bottom of the pan. Pour the sweetened condensed milk over the crust. Sprinkle on pieces of Halloween Oreos and half of the Halloween morsels. Bake for 25-27 minutes. 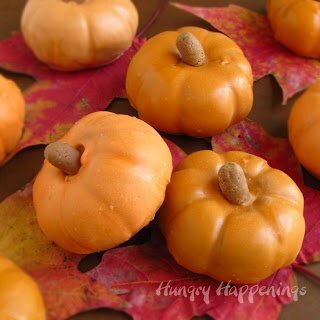 Remove from the oven and sprinkle on the reserved half a bag of Halloween morsels. Return to the oven for 3-5 minutes until the chips melt slightly and until the sweetened condensed milk turns golden brown and the bars appear set around the edges.. The center will still be just a bit jiggly, but it will harden as it cools. Cool completely for at least one hour before cutting into 24 to 30 bars. 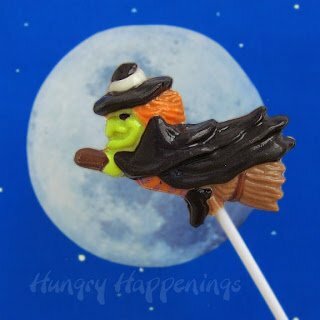 to paint perfect lollipops for Halloween or any occasion. I decided to head over from the homework link party because this just looked so good! Hi Ciara, thanks for stopping by. I'm glad you were intrigued by the photo. Oreo Cookies make the best crust! This sounds like a must try recipe! Oh, I totally agree. I just made another magic bar using Nutter Butters. They are good, but don't even compare to this recipe. Um, I must be under the same rock, 'cause I'm 37 and have never had them either. But, like you, I've seen them EVERYWHERE lately. I had no idea what was so magic about them. I'll have to give your recipe a whirl and see what all the fuss is about. I'm so glad to know I'm not alone in my lack of magic in my life. This makes a lot of bars so I shared them with several different friends and they all asked for the recipe. Ya know it's good when that happens. Oh, that's too bad. The orange and black is so fun. 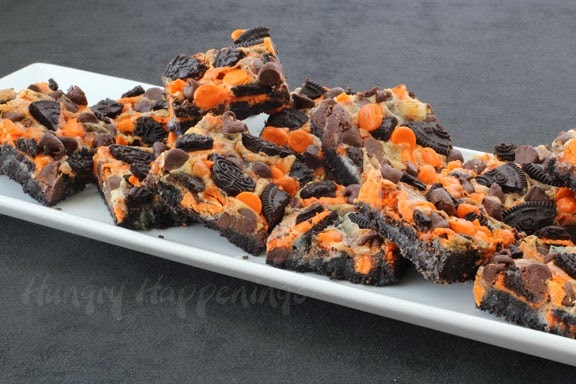 You could just use regular Oreos and add orange M&M's or Reese's Pieces to the bars for a pop of color. did I put them back, now I'll have to go and get them to make these luscious looking bars!! EEK, is right. Go back and get them, you wont be sorry. I'm sure you can come up with something amazing even if you don't use this recipe. Looks so adorable and lovely!!! That's funny … I didn't see you under the rock … I'm still under it! I have not had a magic/7 layer bar, probably because they usually use coconut (I'm not a coconut lover) … must try your version! LOL! It's nice to know I wasn't alone under that rock:) I love coconut, but know that most people aren't fans, so I don't bake with it often. If I did, I'd have to eat the entire things, as my husband would not help out. I need his help! Thanks for the invite, Alexis. I added a few pictures to the party. You had me at the Oreos! 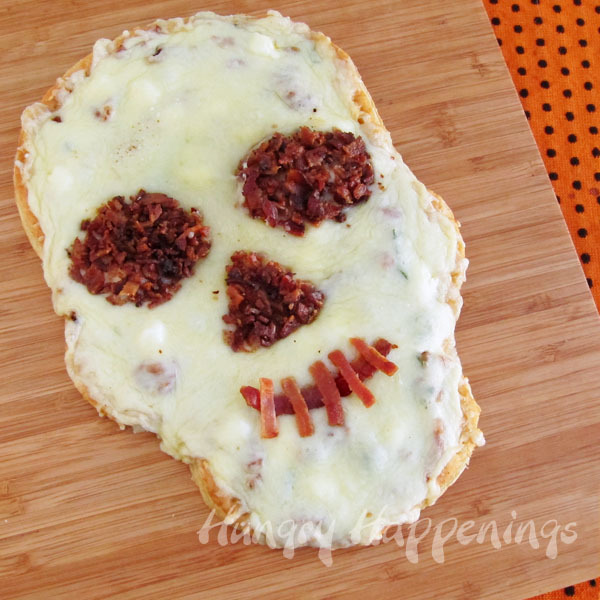 Gotta try this becuase it look great!! Count me as another one coming out from "under a rock". This is going to really sound nuts… but the oreo crust… are we talking using ALL of the cookie with icing middle included? hahahaha I'ver NEVER made an oreo crust!!!! My guess is just pulsing the cookies in the food processor until a fine crumb. Yes? Everyone has to start somewhere! 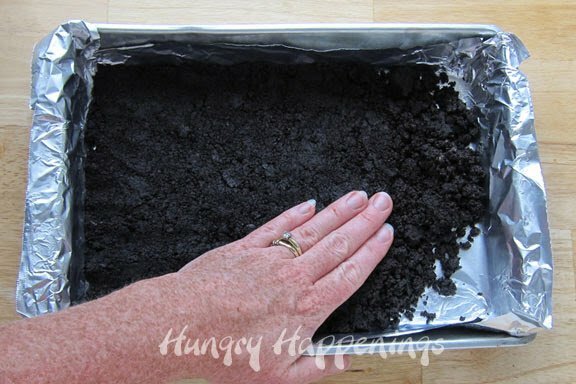 When you make an Oreo crust, just crust the entire cookie into crumbs, filling and all. I think's it's easiest to do that in a food processor, but you can put the cookies in a bag and smash them with a rolling pin or pan. You wont get as fine of crumbs, but it works. I've now made three different magic bars, as the request of family and friends, and these with Oreos are my favorite. 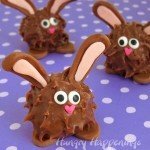 I have never had these either, but they look perfect to make for my Cub Scouts! 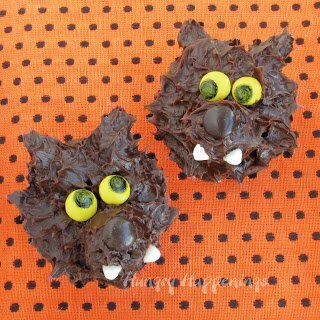 A friend of mine used the recipe to make them for her son's grade school class and they were a huge hit. 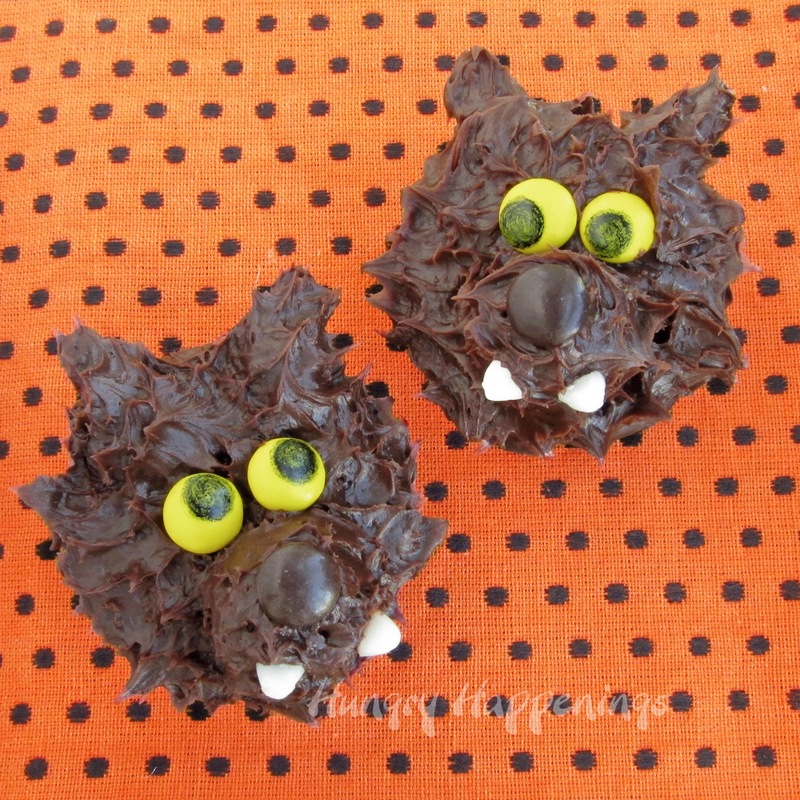 I hope your Cub Scouts like them too! 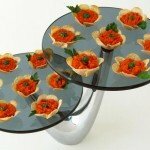 Beth- these look awesome and sound delicious too! I love the bright orange and black together! How fun! Thanks so much, Carolyn. 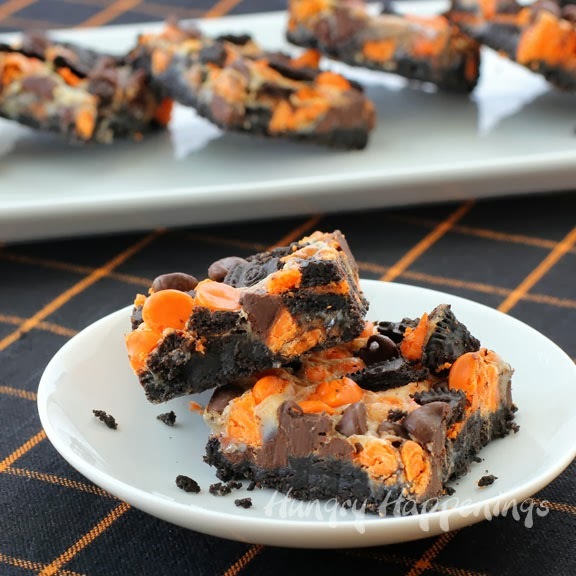 I'm so happy you like these Halloween Magic Bars enough to feature them! I hope you have a wonderful weekend too. 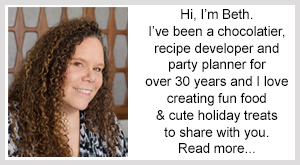 Second time tonight that I randomly clicked over to your blog from a link party – your recipes are too awesome! I love these magic bars! I can't wait to try them, pinning now! That's nice to hear. I'm glad my pictures grabbed your attention. I really appreciate the pins. Here you can see it how it turned out, I did see that you needed a total of 40 Cookies lol so I did not use enough for the crust. My goodness, I just looked at your pictures and I have no idea why your cookie bars turned out black like that. It's as if your crust bubbled up through the cookies and everything else sunk down. Yes, there are 30 regular Oreo cookies in the crust and 10 Halloween Oreo's broken up on top, which is where a lot of the orange color comes from. If you didn't use the Halloween Oreo's you wouldn't have nearly as much orange on top. I hope they at least tasted good. 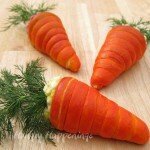 Would enjoy having a printable recipe link. I'm not one that wants to follow a blog on my counter top. I need to look into that. 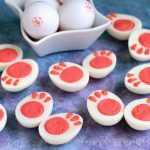 Usually my projects aren't just regular recipes and the step by step pictures are important, but this is just a simple recipe and a printable link would be great. 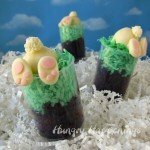 I just made these for a pot luck at work tomorrow, and they are so good! 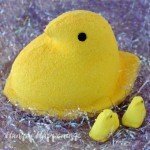 Do they need to be refrigerated? I didn't see that info anywhere? Oh, so sorry to have missed your comment when you made it. You don't need to refrigerate the bars. I hope everyone enjoyed them! 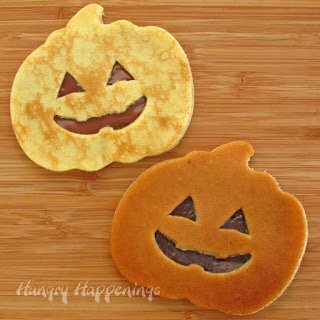 These look so gooey GOOD! Great job, Beth! Thanks, Tara. I really love the flavor of these bars and have made them several times already. Thank you Trish. It's always fun to do the show.